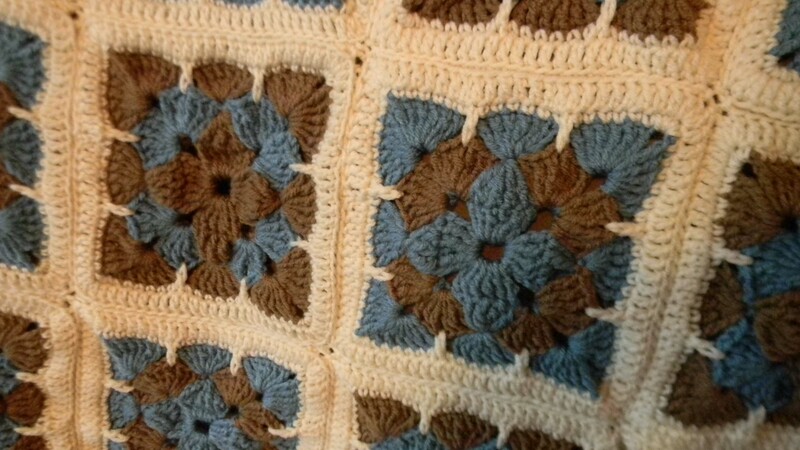 The block I used for this afghan was from the book “200 Crochet Blocks“. I decided to purchase this book after seeing several projects made on Ravelry. All the blocks are the same size and can be mixed and matched. This block is #35 on page 51 the “Tricolor Square”. 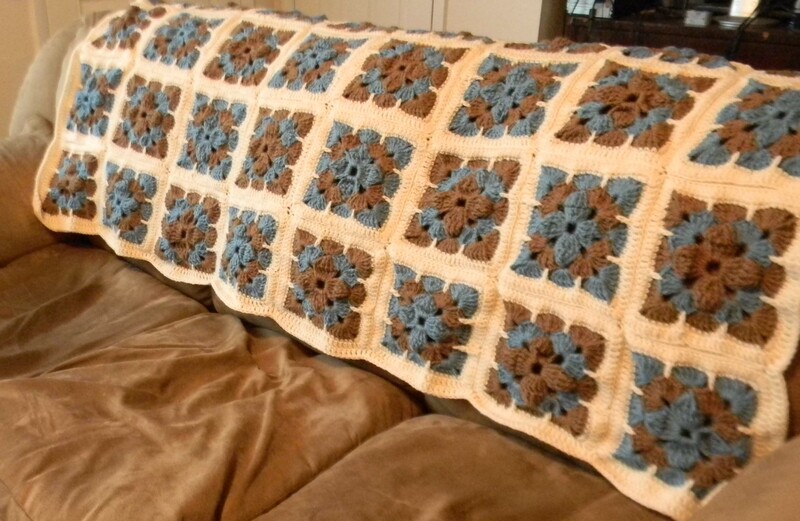 It is a fairly simple block using triple crochets, double crochets, and single crochets. I think the color combinations are endless for this design. I used a size H crochet hook and Red Heart Super Saver yard in Country Blue, Cafe Latte, and Aran. The squares are approx. 8″ x 8″. 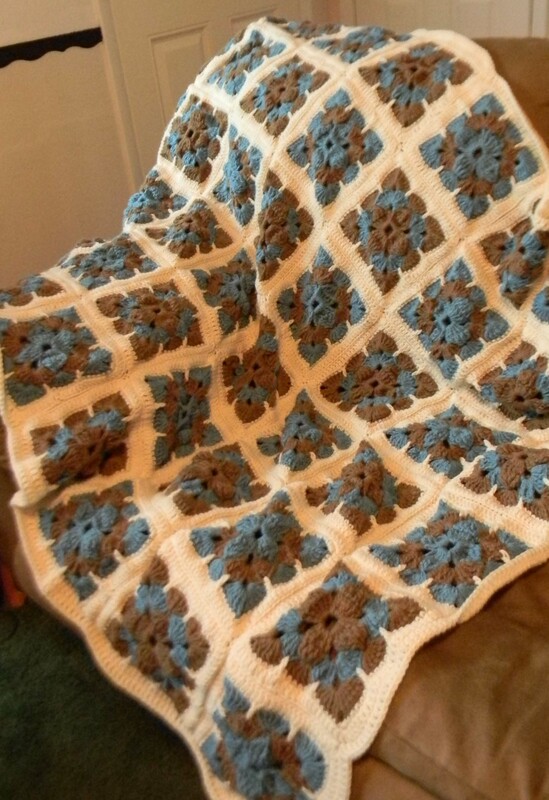 I made the afghan 6 squares by 8 squares, and crocheted a double crochet border around the whole afghan. The finished size is 66 x 50. 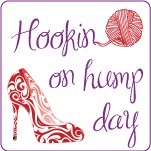 I have already started on a new color combination using a variegated yarn and can’t wait to see how it turns out. If you purchase this book through the link above a % of the sales will go to Nana’s House Children’s Home located in Malabar, Fl. This entry was posted in Afghan, Crafts, Crochet, Posts and tagged 200 Crochet blocks, Afghan pattern, crochet afghan, Tricolor Square. Bookmark the permalink.